Bring that elusive blend of safety and coziness to your outdoors with our range of classic and contemporary outdoor ceiling lights. This is the easiest way to give the outdoor space a smart, energy-conserving facelift without over spending. We offer a wide assortment of options to illuminate your walkways, corridors, and porches. 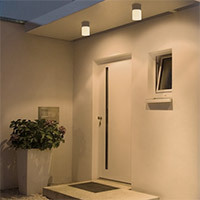 Outdoor ceiling lights typically include fixtures located near doorways. This makes the entrance well lit, inducing warmer, more welcoming vibes. Providing wider, low-voltage light that covers maximum area, outdoors ceiling lights should be chosen carefully. We offer a wide assortment of gorgeous looking outdoor ceiling lights, with Hatteras Floor Lamp and Corsica Ceiling Light in Rubbed Bronze being the most demanded options. Engineered to perfection, these outdoor ceiling lights ensure that you receive perfect all-round symmetric illumination. Outdoor Ceiling Lights There are 114 products.